Summer’s coming, and for many, that season means travel. For people with mobility disabilities, the potential barriers when vacationing are many. However, from access to planes to suitable hotel rooms, people who use wheelchairs in the U.S. have ADA guidelines to help insure the comforts of their trips. But what about the perils of touring the country for people for whom air quality — both indoors and out — is an issue? 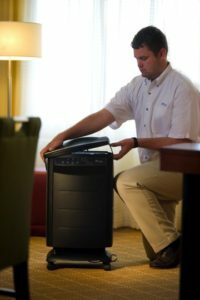 Brian Brault, CEO of PURE Solutions, recognizes that traditional cleaning products, latent germs in the air or on surfaces, and other everyday allergens present real hindrances to comfortable travel for many hotel guests. 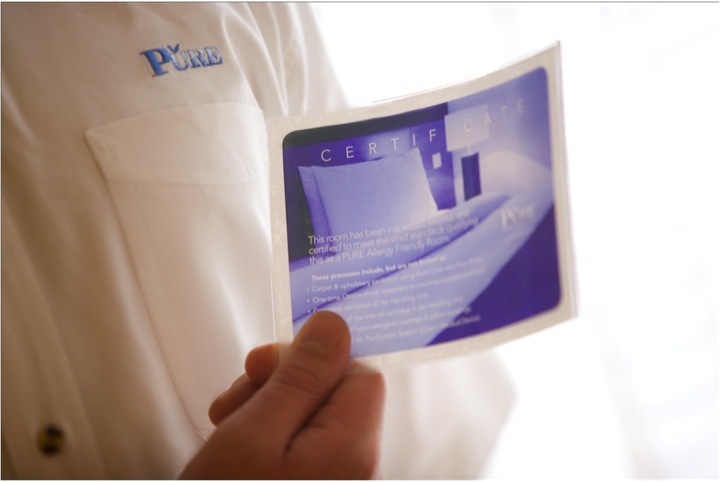 Now, with the help of his company, more than 6,000 hotel rooms in North America and around the world are certified “PURE” rooms, prepared so as to eliminate allergens and asthma triggers and thus provide a “breath of fresh air” to hotel guests. A 2012 survey of travelers by the Cornell University Survey Research Institute, found that 41% of travelers either have breathing difficulties or travel with companions who do. Brault’s PURE rooms provide the type of accommodation for a health condition that hotel proprietors have been challenged to adequately address in the past. In a PURE room, the “soft goods” (linens, carpeting, drapery) and hard surfaces are treated to make it extremely difficult for germs to live and the air is constantly filtered for purity. But, more than that, Brault describes the PURE rooms as a natural outgrowth of his firm’s core values: Making lives better, being genuine, and doing whatever it takes. “It’s how we work,” he says. The PURE room concept began about nine years ago, when Advanced Facilities Services, a service company based in Buffalo, New York owned by Brault was approached by a company who had a patented technology often used to clean cruise ship air filters. Jens Ringvall from Sweden, a principal of this company had developed a way of cleansing the air filter system and the cabins. Brault realized his work could be applied to hotel rooms. Deep-cleaning the air handling unit, down to disinfecting the coils of the heating and air conditioning mechanisms. Using tea-tree oil cartridges for antimicrobial and disinfectant purposes, to maintain sanitized conditions in the air-handling unit. Cleaning carpet and upholstery with a patented solution designed to deeply remove dirt, bacteria, and mold. Employing a one-time “shock” treatment to restore fresh, crisp air by destroying mold and bacteria and removing lingering odors from the likes of cigarette smoke or pets. Applying the “PURE Shield,” a bacteriostatic barrier, to all room surfaces to repel microorganisms and prevent their growth. Purifying the air to continuously protect against airborne irritants through a medical grade air purifier. Using only allergy-friendly bedding, including micro-fiber, mono-filament mattresses and pillowcase encasements. Maintaining PURE standards is not a one-time transaction for hotels, Brault relates. “Once the room is converted and inspected, it is certified,” he says. How prevalent are PURE rooms? Brault notes, “Many of the nation’s best hotels, and all Hyatt full service brand hotels, offer these rooms.” He estimates that hotels who adopt the PURE room concept generally convert about five percent of their rooms to PURE. To many guests, staying in a PURE room is often an eye-opening (or, a refreshingly eye-closing) experience. “Those staying in PURE rooms often report having the best night’s sleep in many years, even better than in their own homes,” says Brault. Still, the company is faced with the issue of how to share the success and luxury of clean-breathing air and a good night’s sleep with the public. Originally, the concept seemed to be the right idea at the right time. Says Brault: “We talked to a brand strategist for Hilton and one of the head engineers at Marriott and some of the professors at the Cornell University hospitality program and found that the whole issue of indoor air quality was very much on the radar for the hotel branch of the hospitality industry. Our trial run, about eight years, was successful, and hotel people invested in our product.” He adds that data on the number of travelers with breathing issues were a big factor in convincing hoteliers of the need to offer such rooms in some or all of their properties. However, as in many sectors, dips in the economy forced the company to rethink their marketing strategy. Says BRAULT, “The economy of 2008 and 2009 forced us to work out creative ways to market the rooms, including free installation, with profit-sharing on the premium charged for the room” Most hotels charge about twenty dollars more a night for the PURE rooms. For Westin, being mindful of guest needs is part of the culture. ”We are very cognizant of helping people with disabilities,” Henderson says. “All the Starwood Brands are very health conscious anyway…and the desk staff is specially trained to note guest needs.” Westin even goes above and beyond the expected to provide comforts of home. “One of our services is to send chicken soup up to the room of sick guests,” says Henderson. Hyatt is taking an additional step to help those with breathing difficulties by introducing a line of fragrance-free toiletries this year. Smith also notes that the hotel’s food and beverage services also cater to potential allergy issues. PURE rooms generally cost a little more per night, due to the extra cost associated with getting them ready. However, customer feedback reveals that those who use the PURE rooms find them well worth the small additional cost. The PURE room website provides a list of hotels offering PURE rooms. Web visitors can search by either hotel chain or location. Once the seeker decides to make the reservation, that person is re-directed to the specific hotel’s website. The company is on track to have six thousand PURE rooms certified by end of 2013. The firm has a global presence now, as well as its base of rooms in North America, and plans to continue growing. In addition to extending its presence in hotels, the firm plans to market some of its products for home use.